General Observations: For the most part October 2012 continued the smooth sailing of September, our cold-weather fall crops yielded well and gave us a nice boost in marketable product that helped soften the effect of the tomatoes tapering off. Looking at the data and writing this summary in October 2013 I can see some interesting comparisons. In 2012 tomato harvest ran from 7/13-10/5 (roughly 80 day harvest period), while our 2013 tomato harvest is running 7/24-present (75 days and counting). As of the time of writing it looks like we could get another week or so of yield. By October last year most of the planting was finished, so we had the time to accomplish most of our fall tasks including crop care, cover-cropping and other end of season preparation and clean up tasks, while keeping up with regular harvests and markets. As the weather became colder with frequent rain we had opportunities for catching up on administrative duties and working on summarizing the data we collect throughout the season. The rough patch came at the end of the month, with Hurricane Sandy making landfall and colliding with a Nor’easter over New Jersey. Considering the destruction wrought by the storm across the state and region, the farm came through relatively unscathed. The tally of damage was a broken window in the office, part of the walk-in cooler unit blown off, loosing the plastic on the FHG high-tunnel and damaged plastic on RH that blew off in a wind storm later that year. We also lost power, and subsequently our well water, for more than two weeks. Numerous trees were blown down, but incredibly none falling on any structures or equipment. A large branch from a willow tree that fell on the baby chick pen miraculously did not cause damage or injure any birds. Compared to others around the state, we were lucky. However our growing season was severely crippled following the storm. Already saturated fields were inundated by inches more rain and crops were damaged and lost. The lack of power and clean water meant no washing or refrigerating what we could still harvest and the widespread destruction across the state meant even when we were able to get to our markets (after many detours) we found many fewer customers who were able to attend and/or had electricity to be able to store the perishable vegetables we sell. A big thanks to those who could and did attend even as they themselves were dealing with their own part of the aftermath of the storm. It was a great morale boost and emotional support to see all the regulars, exchange stories of the storm and trade complaints about the aftermath. Equipment 20hrs: Less time on the machines this month. This is a function of less planting and other field work as well as the saturated reality of much of last October. There was some equipment used on 10/11 as part of some final cover crop seeding. RR and KG received training on working in seed using IH265 with the Williams Tool Bar cultivator’s spring tines and the Ford towing the disc cultivator, then used ATV with roller to compress soil over the seed. On 10/24 the box truck had a minor accident in Hopewell when it collided with a lamp post. The accident was reported promptly and without issue. Administration 101.5hrs: Time spent on administrative tasks tripled from September, but was roughly the same as October 2011. As the season is winding down and days growing shorter, darker, colder, and wetter the appeal of spending time in the office tabulating data and summarizing the season increases. 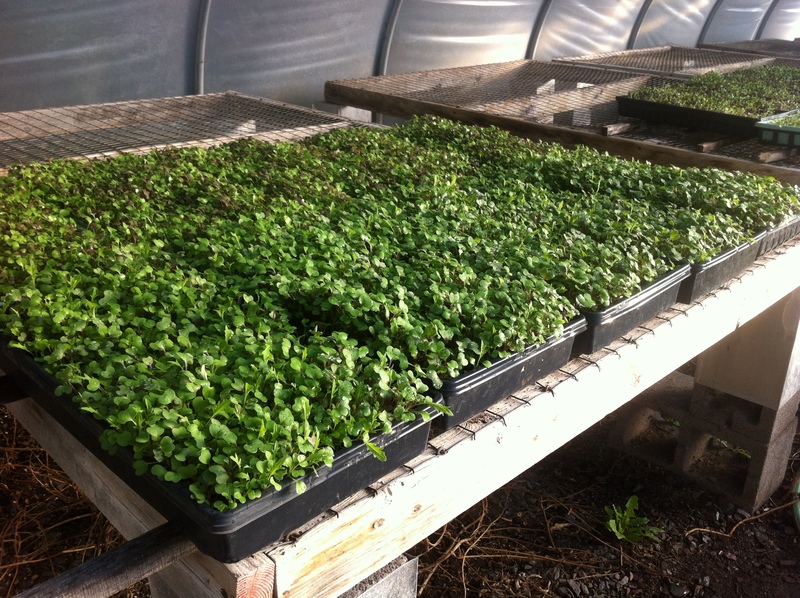 -inventory of supplies and restock: irrigation, marketing, seed, greenhouse, etc. -RR and KG assisted audit of greenhouse and production. Swiss Chard chosen for audit, needed to track production of crop from seedling through to market sales to show it was grown by NSF. Found 220ft bed yields 480 bunches total over a several week harvest period. -KG presented crop rotation map and description of rotation. -Reiteration that a physical barrier must be maintained between organic and non-organic crops in truck and cooler. At minimum, cardboard that is discarded can be used. 10/20- MR receives ‘BFF’ Award from NOFA-NJ for “Contribution and Support for NOFA’s Beginning Farmer Program”. BFF stands for Beginning Farmer Friend. Congratulations MR! Infrastructure 104.5hrs: General clean-up jobs typically fall under the infrastructure element. In October that means a lot of things coming out of the fields to prepare for winter; used drip tape, tomato stakes and trellising string, etc. The ongoing wood splitting also falls under this element. 10/3- Tomato field clean-up, ½ field finished. 10/3 to 10/5- Cleaning out adolescent chicken pen in preparation for them moving in. A concrete block floor was installed. Chix moved in. Greenhouse 12hrs: By this time of the year there is not too much left to do in the greenhouses. The few hours logged were mostly clean-up although an entry on 10/2 reports that the FHG tomatoes were “pimped out”, pruned, clipped, and cleaned-up. As the hurricane approached we opted to leave the plastic on the greenhouses and secure them as best we could. During the hurricane we observed some serious bending and racking of the Farmhouse Gothic greenhouse as the plastic was catching a lot of wind. The call was made to cut the plastic in the hope of preventing the loss of the structure. It made for an exciting time in the middle of the storm! We were able to cut the plastic using an improvised tool (harvest knife taped to a long pole) to cut along the ridge line and secure the two halves. The structure survived and the plastic was replaced the following spring. Composting 12hrs: Some of RR home-made compost tea was applied to GH tomatoes. Also regular compost applications prior to direct seeding in the BGBs and garlic planting. Planting 39.5 hrs: There was not much planting going on in October. 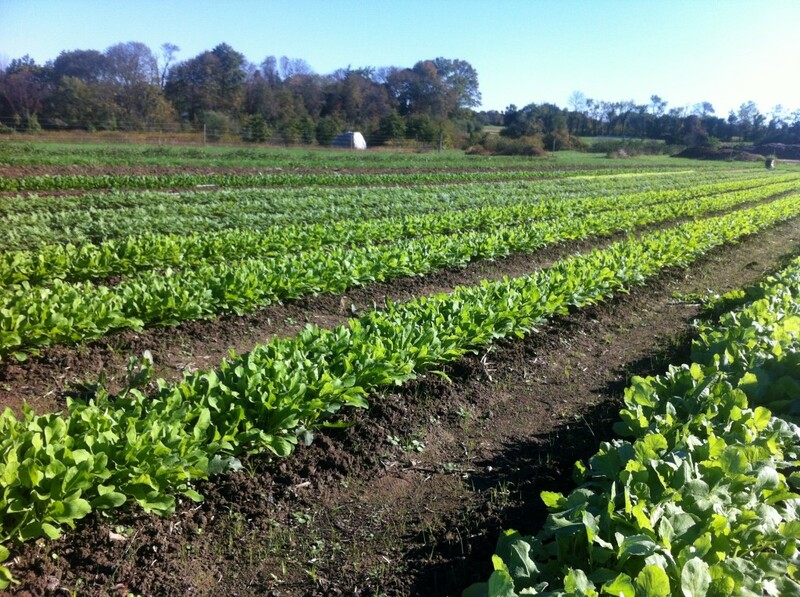 The BGBs were seeded a final time on 10/13; 2 beds of salad and 1 bed spinach. 4 BGBs where also cover cropped in a rye, pea, vetch mix. On 10/18 we got our garlic planted. MR, TH, BY, RR, KG were crew for the planting. Notes remark on the beautiful weather and the increase in efficiency from the previous year. Four beds with two rows each were planted. Below is our planting sheet which contains some of the calculations we used. 4 Beds X 2 Rows X 2640 inches (220ft bed length) / by our spacing of 5 inches. This means we need 4224 garlic cloves to fill the space, rounded up to 4500 to give us a buffer. We had 48# of our own garlic saved; on average we get 46 cloves per pound of garlic yielding 2208 cloves. From 15# of our own small garlic, yielding 88 cloves per pound, we got 1320 cloves. Together 3528 cloves of our own seed stock. We also had 12# purchased seed garlic, at an average 42 cloves per pound yielding 504 cloves. Final total of available garlic for planting was 4032 cloves, which was 200-500 less than we calculated for, however since the field in which the garlic was planted is prone to flooding on it’s ends it was not necessarily a bad thing to shorten the beds up. Handling 121.5 hrs: Regular Wednesday, Thursday and Friday rinse and sorting continued. In addition, on 10/10 sorting, stripping, and breaking cloves apart of seed garlic was completed. Marketing 165 hrs: In addition to our regular markets, CH attended the market at Gravity Hill Farm with an offering of specialty dried herb teas. Special Projects 9 hrs: Most of the special project hours this month logged by KG for the Micro Green project. Thanks to RR for helping with another late night harvest by flashlight on 10/13. On 10/15 North Slope hosted a NOFA-NJ incubator interview and social dinner for NOFA Beginning Farmers Tom, Jonathan, and Taylor. The log reads “excellent evening, nice energy and enthusiasm” and I must agree, it was a fun time. Weather: October was wet, and then Hurricane Sandy hit on the 29th. Crop Care, especially weeding, is something that always seems to fall by wayside when the farm’s other priorities become more pressing. My intention in taking on this element in my third year is to be an advocate for our crops; trying to prioritize care where and when it is needed and keep track all of our crops’ needs. 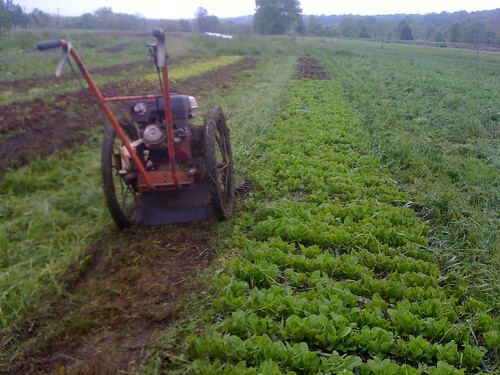 Another thing I’d like to focus on is trying to decrease worker hours spent weeding by keeping up on scuffle and wheel hoeing and making use of our mechanical cultivation options. The time spent rescuing crops from weeds by hand has a much high cost in time than if the weeds were addressed earlier. 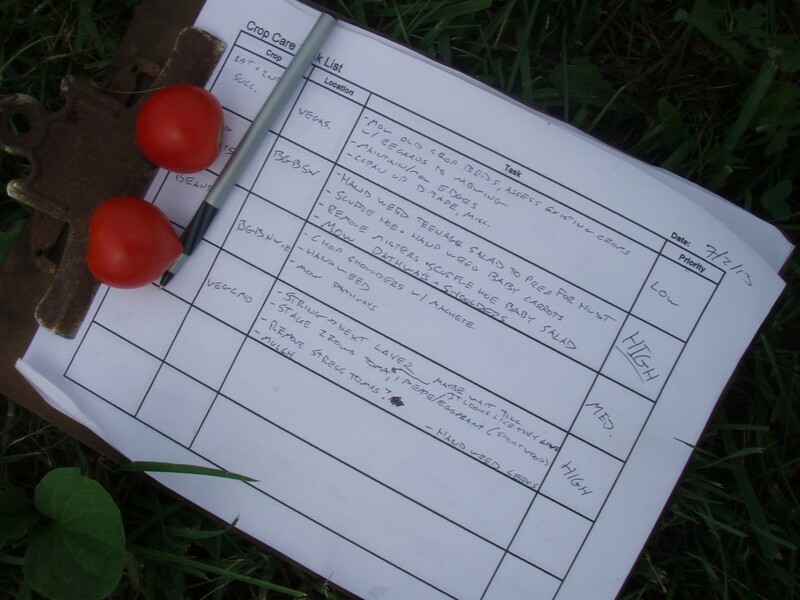 To help manage this I have created a Task List Form for a weekly field-walk in which I lay out the Crop Care jobs for the week with notes on priority and method of task completion. Weed Control- Observation, prioritization, and deciding on the method of treatment for weeds, then working with the crew to accomplish tasks. Mulching- Managing application of straw mulch. 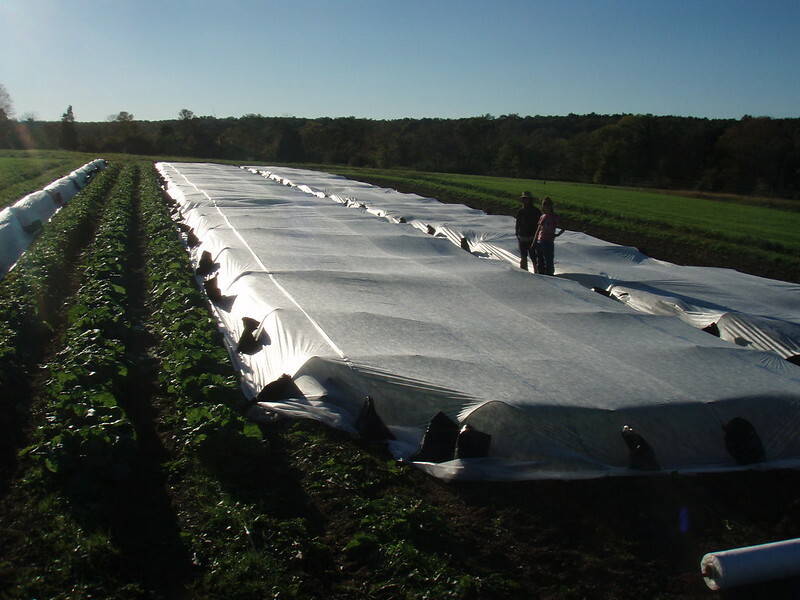 Certain crops receive straw mulch to smother weeds and prevent splash-back of soil. Field Access/Field Clean Up- Keeping field edges mowed and fields clean of debris. Removing driptape, sandbags, and other items from field after use. In our second year at NSF, as part of the training program, interns are encouraged to choose a work element as a focus for the season. I chose planting because I wanted to get a thorough understanding of what is ultimately the main goal of farming; growing food. One of the motivations driving me to farm is the desire to see all aspects of the production process, to see my role in it, and to be able to take satisfaction from producing a product from start to finish. Within the farm’s system the planting element especially encompasses that scope, from planning, through production, to the final product at the end of it. The first task for the season was to create a crop plan. The crop plan lays out a rough schedule for the course of the season and helps to keep the farm on track as the pressure mounts. 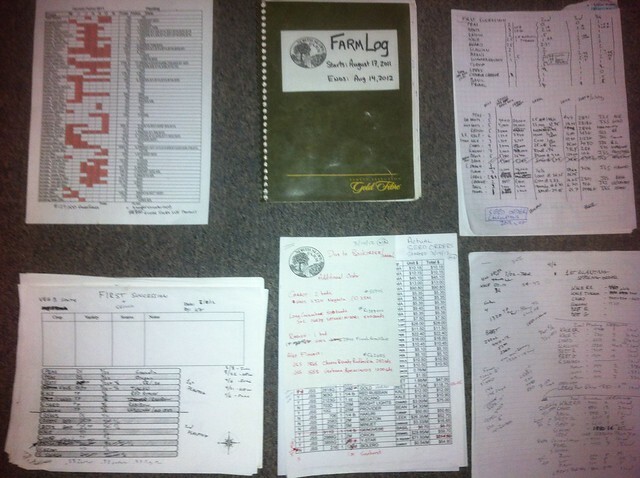 My plan was based off previous crop plans, especially Steve’s (ST) from 2011 for which much documentation was available, modified by having additional land in cultivation and the analysis of the 2011 season. Following NSF’s system of succession planting and incorporating our crop rotation I created a plan that had 6 main field successions plus a field tomato planting. 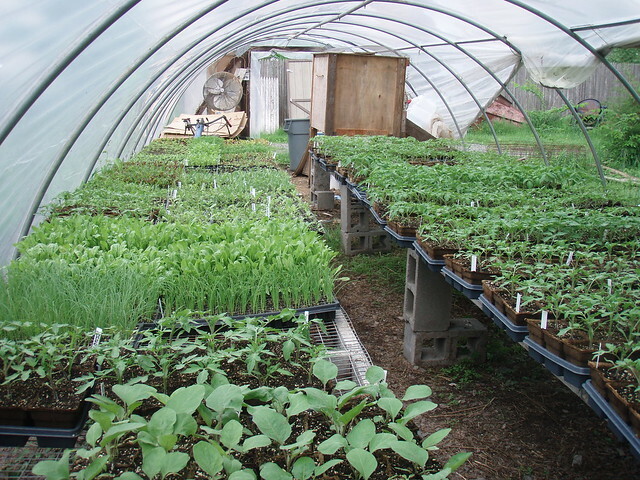 In addition I planned to have regular salad seedings in the BGBs every two weeks, as well as carrots, radishes, turnips, and other greens as the season suited. Once I had this rough plan I could start doing some calculations for the seed order. Thanks to Rita (RR) for doing an inventory of the seed the farm had in stock, making sure we didn’t order more of something we already had too much of. Figuring out the right quantities to order could be tricky at times as there isn’t really a standardized unit of measurement for seed, even within a single seed catalog you can find some seed measured by weight and others by count and we use 3-4 sources for our seed. A rule of thumb we often used was after all the calculations, double the amount to be safe. Our initial order was around 2,000 dollars, which got us through most of the season. The season’s total was around 3,000 dollars for seed. One of the perks of taking on the planting element is selecting varieties. NSF has a cohort of tried and true crops and varieties that need to find there way into the crop plan, but there is some room for experimentation. I was happy with both the leeks and the Napa cabbage which were added to the plan this past season. The leek seems to be a good candidate to replace the scallion as an allium we can offer; for us scallions are a drain in labor hours for harvesting and handling that the market price doesn’t reflect. Leeks on the other hand require less time to prepare for market. I’m excited to try leeks again using a technique I saw Elliot Coleman present at the NOFA-NJ winter conference that doesn’t require hilling, simply by transplanting the seedlings in deep holes the same effect is achieved. The Napa cabbage was another hit, we got a decent yield even during heat waves, but they really shined later in fall when we got some real giants and more cabbage then we knew what to do with. Once the plan is made and the seeds have arrived the growing can begin. 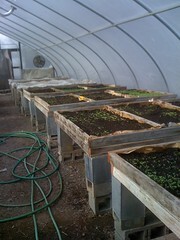 Our first official day of the season was March 6th, and by the 8th peas were being seeded. More peas were seeded in the field on 3/21 as was our first BGB succession and the first succession of field vegetables were transplanted out on 4/6, which was all right on time according to the plan! For the most part I feel like things went fairly smoothly, although the plan changed as the season progressed. In my memory the weather on a whole was not as wet as 2011 and we faced fewer delays due to wet fields. The exception to this might have been our field tomato planting. We tried a new method on NSF for tomatos this past season, inspired by the practice of no-till farming we sought to use a minimal tillage technique. In place of the standard practice of preparing field beds we cut furrows through the cover cropped field, filled the furrows with compost, and transplanted directly into that. In this manner we only tilled the soil where the transplants would go, leaving as much of the field’s soil biology as undisturbed as we could. Unfortunately we used a shank that was more aggressive than we need and ended up with trenches deeper than we needed. Then in the first weeks following the transplanting we got a bit more rain than we would have liked and the furrows in our heavy clay soil held water like troughs. The result was transplant shock and nearly all of our tomatoes turned a very unhealthy looking yellow. The prospect of our field tomato succession failing was frightening as tomatoes are a huge part of our market revenue, so it wasn’t long before panic set in. I sought to plant more tomatoes, but by June it’s a bit late to start new tomato seedlings. Luckily RR had a small but diverse selection left over from her seedling sales at market. We planted tomatoes everywhere we could, both Ralphs House and Farm House Gothic, some pilfered beds from the 579 flower field, and even a small space on the fringe of the farm which hadn’t been used in some time. In the end the original tomatoes bounced back after a few weeks of dryer weather and some compost tea delivered via our new mobile water tank w/ PTO pump. The delay in growth cost us, we were a few weeks late in hitting our tomato stride, but after experiencing all those yellowing adolescent plants it was a relief just to have tomatoes producing at all. The vegetable succession went more smoothly. Successions 1-3 did well and were on time. We did abandon some scallions to the weeds in the 2nd. In our 2nd and 3rd succession the kale and chard held on well past what was planned, letting us supplement the later successions. We had the idea to mow off some of the old chard above the root, MR let me try it, and the results weren’t too bad. For the 5 minutes it took to mow we got some re-growth we were able to harvest for a few more weeks. The cabbage in the 3rd succession provided some yield, even as it battled the heat of the summer. The 4th succession went a bit less smoothly, much of the direct seeded crop failed to get good germination and we were short on the transplants. This led to some lighter than ideal harvests some weeks, but with the supplemental crops from 2nd and 3rd succession we did our best to get our harvests. A bitter-sweet windfall we got to harvest some purslane from the 4th succession field where beets had failed to germinate. We lingered in the 4th succession field, extending its use by reseeding in the beds were crops had failed. As a result we ended up planting only 5 successions total. In the 5th succession we had a lot of space for direct seeding, after my experience direct seeding the 4th succession with poor results I was anxious to try again. One weekend in mid-September I went out with a bucket of seed and the old 4-point seeder which has fallen out of favor at NSF, in what I presumed to be futile gesture, did seed 10 beds in various greens, radishes, and turnips. I remember it took me quite a while to set up the irrigation afterwards. Within a couple of weeks the field was filled with green in nice straight rows, everything was germinating! Totally bucking my expectation, the direct seeding worked better than I could have asked for. I was very proud of that final succession. For the Big Garden Beds I wanted to really solidify salad production and they key to doing that at NSF is planting 2 beds of salad every two weeks. We ended up doing 13 successions of plantings this past season. Space in the BGBs got cramped at some points so it will be nice bringing the new BGBs into production this coming season. I felt like we did a good job of keeping on track with our salad successions as far as planting every two weeks throughout the season. 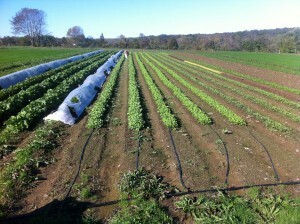 We had salad at points when no one else at WWCFM did and only really missed one seeding date in late July/Early August. Really nailing down germination would be a big thing for BGB production. We also had a good amount of carrots especially late season, we kept up planting to take us into winter. I learned a lot in this past year focusing on the planting element, this summary barely scratches the surface of the experience I had and gained. Above all, it was certainly enjoyable and fulfilling to work on an element which spans so much of the farm’s activities. By taking on the planting element I got a preview of what managing a small farm entails, and got to take a shot at doing a lot of it and learning through practice. I look forward to my third year here at North Slope and to continuing to hone and develop my skills as a farmer. 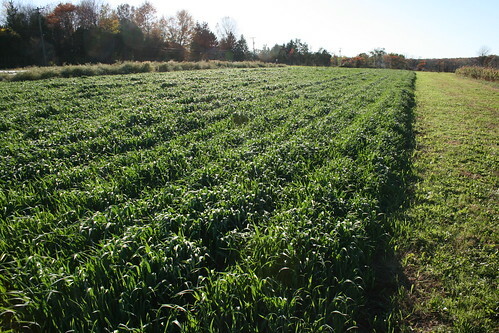 Create and execute a vegetable production crop plan for the 2012 season, working with the Farm Manager to ensure compliance with the overall Farm Plan as well as the organic standards and procedures of NOFA and USDA. General Observations: This May, like 2010, was the second highest in terms of worker hours. That means a busy month. Added to the planting of BGBs and field succession plantings in May are the planting of our field tomatoes and flower successions. On top of all this the warm and wet weather is causing and explosion of growth both of crops and weeds, meaning more time must be spend on crop care and infrastructure keeping the crops ahead of the weeds and maintaining mowed pathways and access to crops. On 5/2 the groundhog who had been eating the seedlings on tables by the farmstand was finally captured! It was dispatched and making an effort to not waste the groundhog, stew was made. The stew was delicious, but the groundhog meat was less than enjoyable… Casey added his thoughts on the season so far to the log on 5/9. There was a power outage in the area on 5/26 that prevented some irrigation. Administration 51 hrs: On 5/16 KG completed the May 2010 monthly summary. A rainy day on 5/17 was a good time for a staff meeting. A task list was generated; the greenhouse would need compost sifted and planned to start seeding the 4th succession, under the planting element the need to trelise grafted tomatoes in the farmhouse gothic was highlighted and 6/15 was planned for as the 3rd succession planting date. Preparation of the next successions field was also discussed. Various tasks related to cropcare were also outlined, including storing remay for the season and trellising of peas and tomatoes. On 5/24 there is a note in the log about sorting through email and creating a system of folders to keep the email better organized. There was also a note about calculating income/expenses to date. Also the regular admin duties of payroll and bill payment were performed throughout the month. Infrastructure 68 hrs: Some of the various infrastructure work this month included a mowing of pathways and access lanes on 5/9, setting up a submain and drip-tape for the 579 Flower Field on 5/13, an intro to the weedwacker on 5/17 for first year trainees JR, RR, and KG followed by RR weedwacking around the electric fence line and posts, and the final cleaning of the farmhouse pool by RCM on 5/24. Also on 5/9 a note in the log about irrigation observes that 20 BGB drip tubes (4 beds) on full yields the ideal pressure of 12-14 PSI on average. Greenhouse 64 hrs:On 5/1 20 flats of basil were seeded for Nomad Pizza, a note in the log declares the greenhouses to be full and tight. On 5/4 tomato grafting was completed. See this link for more information about how our grafted tomatoes did in 2011. Between 5/14 and 5/17 the third vegi succession was seeded. On 5/17, while seeding the forth succession of seedlings for sale, the seeding shed“Quilting Circle” was established and songs were written and sung. 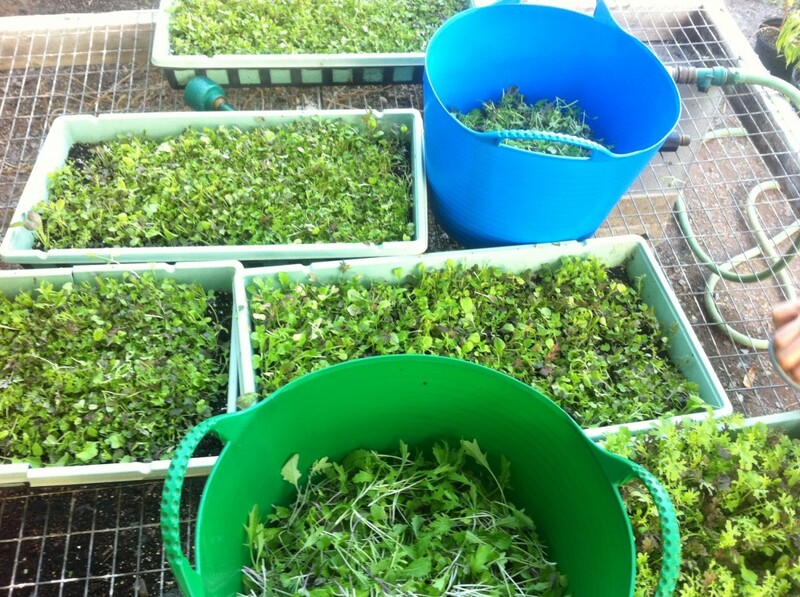 Composting 68 hrs: In addition to compost sifted for the greenhouse, several applications were made to field beds. 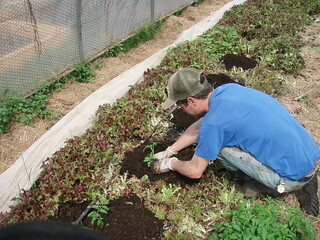 On 5/10 8 beds in VEG B mid, 5/12 Tomato field beds (Maddona North) were prepared- “rip, compost, rip, till, plant”, and on 5/13 7 beds in the 579 field were composted. Planting 127 hrs: May is a busy month for planting because in addition to the regular BGBs and a field succession planting, our tomatoes are planted into the field. 5/3 was a full planting day; direct seeding (DS) of 2 beds of salad and 2 beds of carrots into the BGBs in the AM followed by transplanting (TP) of squash, beets, and chard in the PM. On 5/6 kale and scallion TPs made it out into the field. 5/9 saw 8 apple trees added to the fruit cluster. 5/12 and 5/13 saw the grafted tomato TPs planted in the farmhouse gothic as well as 1 row of sungold tomatos planted in the field. Also on 5/13 4 beds worth of Zinnea TPs were planted in the 579 field. On 5/15 CH and MR finished replacement planting in the fruit cluster, replacing trees that had been lost over the winter. 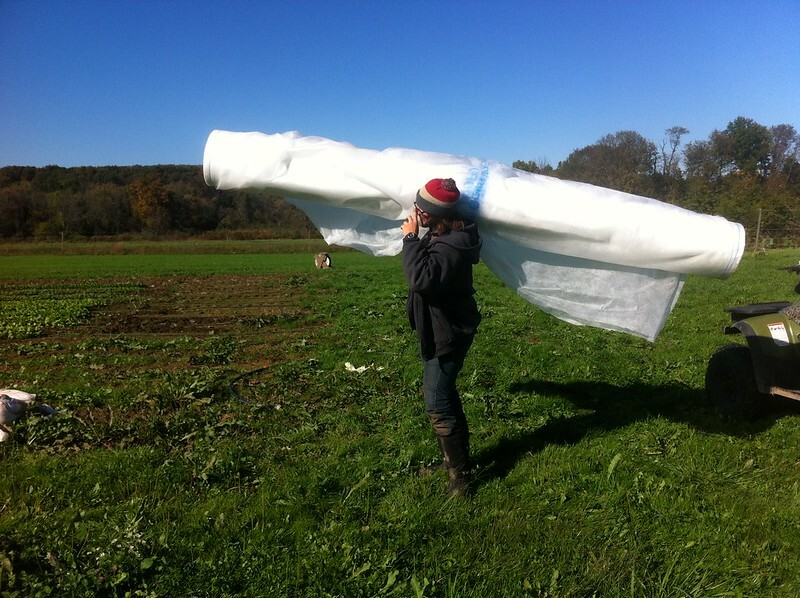 5/26 was tomato planting day, our field tomatoes were TPed out into the field! On 5/27 some direct seeding of beans, turnips, and beets brought the 2nd vegi succession planting to completion. Crop Care 351 hrs: Many worker hours went into crop care last May as the warm and wet weather brought with it vigorous weed growth. On 5/5 the BGBs were mowed and maintained. 5/10 saw the peas trellised. On 5/11 and 5/12 a straw mulch was laid around the strawberry plants in anticipation of fruiting, the straw acts as a weed suppressant as well as a barrier keeping the fruit out of the dirt, cleaner and easier to spot when harvesting. On 5/18 grass was cut away from the garlic to keep it from becoming overwhelmed and on 5/19 hand weeding of the BGBs took place, a note in the log calculated 5 worker hours per bed. 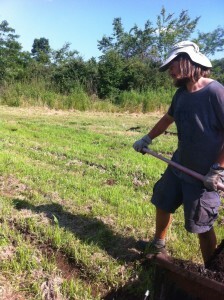 5/23 and 5/24 saw the asparagus beds weeded and on 5/25 BGBs and 3 field beds were scuffle hoed. Finally on 5/31 trellising of the grafted greenhouse tomatoes began. Harvesting 214 hrs: In May last year NSF had the following crops available: Field salad, arugula, tatsoi, spinach, swiss chard, kale, fennel, radishes, peas, spring garlic from the 579 field, and for the first time available at market, our very own strawberries! On 5/24 in the log there are extensive notes on strawberry harvesting, establishing a protocol for harvesting every 4 days ripe and 3/4ths ripe strawberries, sorting into pint and quart containers on tomato trays and topping these containers off once at market to ensure full containers overflowing with unblemished fruit for our customers to enjoy. The notes also include some detailed information comparing variety yields and fruit size. Handling 69 hrs: On 5/5 the walk-in cooler was turned back on in preparation for the start of the WWCFM, the previous harvest having been frozen by a malfunction. Throughout the month washing took place, Wednesday morning and Friday afternoon of our crops harvested for our Hopewell and WWCFM markets. Market 127 hrs: Our first Saturday market of the season began this month, NSF’s 8th season at WWCFM. A note on the weather says it was a “beautiful day for first market” A 5/21 note relating to marketing said we had sold out of everything, and maxed out our weekly harvest for everything except for salad. Special Projects 38 hrs: On 5/2 Veg C north was plowed by ST for his special project “Blackbird Meadows” the goal of which was to supply a variety of fresh produce on a weekly basis tailored to meet the needs of the local New Hope restaurant “Sprig and Vine”. The end of May saw hay baling, collection and storage of hay bales in the seed shed for later use. Weather: No mention of any frost at night in the log. Week 1: Sunny and beautiful weather, transitioning to storms and then back to sun by week’s end. Week 2: Sunny, getting dry. Irrigation needed by the end of the week. Week 3: “Rainy weather settling in” followed by “SATURATED” later in the week. Sunny day on the 21st. Week 4: Rain returns after a break on the 21st. 40% chance all week delays hay cutting, but finally sunny and hot weather arriving on the 27th allows for haying before going to seed.